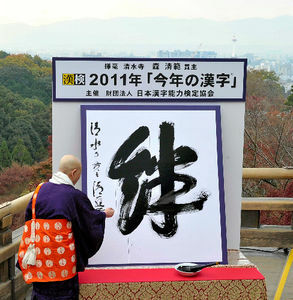 This year, Japanese people chose the kanji 絆 (きずな – kizuna) to represent them. It means “bonds” and it’s been selected because of the collaboration of the Japanese people after the earthquake and tsunami to recover the affected areas. After being chosen, the kanji is written by an expert calligrapher in the Kiyomizu-dera temple in Kyoto. As you can see the selection of those kanji were so influenced by the disaster happened 9 months ago. What do you think about those kanji? I admire the positive outlook that kizuna represents. Great choice!